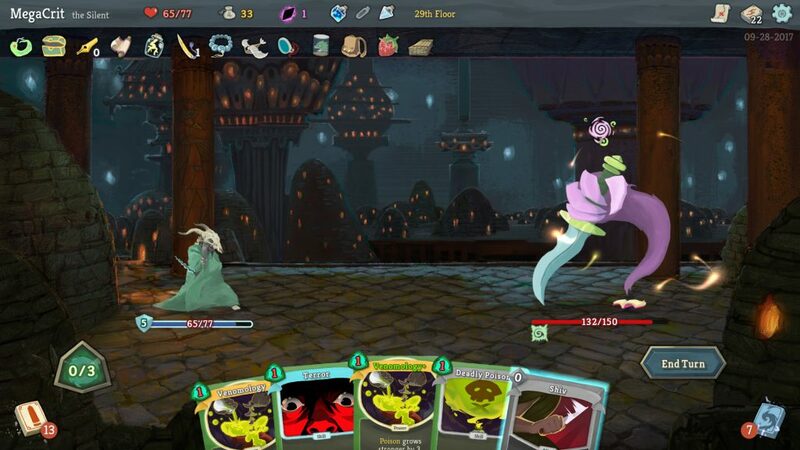 Slay The Spire, the deck-building roguelike card battler from Mega Crit, officialy launches today. After a year or so in early access, today sees the release of version 1.0. As it often goes with games like this one, the developers are probably going to keep tweaking it behind the scenes, but as far as big changes go, this is it. There’s a brand new trailer for the occasion, and you can watch it below the break. If you haven’t heard of the game before, the premise is simple. You pick one of the three heroes and enter a randomly generated dungeon. Except it’s not really a dungeon – it’s a bunch of encounters tied together by invisible corridors. You hop from one fight to another, ascending the titular spire. Along the way, you meet merchants, rest at campfires, discover hidden treasures and meet quirky characters. Once your reach the top of a section, you fight a boss. Clear it, and you can proceed to the next section. After every battle, you get a new card to add to your deck. The battles are turn based, and you draw a new hand for each turn. Everything you don’t spend is discarded. The amount of cards you can play is governed by energy, so choose your moves wisely. There are also relics which last until the end of the run, and provide you with various bonuses. It’s extremely easy to get into, as the whole thing’s pretty intuitive – choose a card, do damage. As you progress, though, it slowly unfolds to reveal deeper layers, like a geeky onion. There are hundreds of synergies between cards, powers that let you bend the rules, relics that completely alter your play style… It’s pretty deep, is what I’m saying.